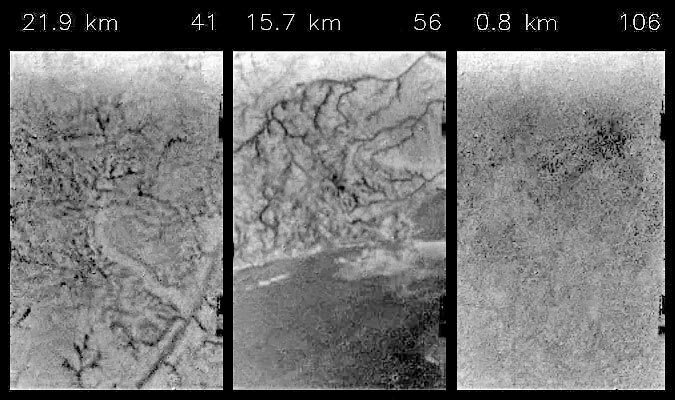 These frames are taken from a short animation made up from a sequence of images taken by the Descent Imager/Spectral Radiometer (DISR) instrument on board ESA's Huygens probe, during its successful descent to Titan on Jan. 14, 2005 (watch below video). Huygens emerged from the clouds at around 30 kilometers (about 19 miles) altitude. The DISR consists of a downward-looking High Resolution Imager (HRI), a Medium Resolution Imager (MRI), which looks out at an angle, and a Side Looking Imager (SLI). For this animation, most images used were captured by the HRI and MRI. The still frames shown here have been brightened and sharpened a little to help pick out linear features over a wide range of altitudes. Lorenz also thought that liquids on Titan would form crater lakes. Of course, we now know that Titan does not sport the craters expected by conventional theory. The expectations of the Electric Universe were also made clear before Cassini began to explore Titan. The differences from conventional theory could not be starker. Titan was expected to be a youthful moon bearing the electrical scars of its birth and other encounters as it established a stable orbit. The type of scarring was expected to be similar to that of Venus where a heavy atmosphere causes filamentation of cosmic discharges and the formation of surface patterns of sinuous channels. On close inspection some channels would be found to be composed of crater chains. The images above support the Electric universe model. At different altitudes, the most obvious features are filamentary. There are no large craters. The dendritic pattern in the left hand image shows features that distinguish it as a surface lightning channel, known technically as a “Lichtenberg figure.” Unlike a liquid, surface lightning doesn’t respect the topography and will flow uphill as well as down. There is circumstantial evidence that some of the dark channels seen in early images have their source and sink at the “shoreline” with the darker areas. Hopefully, further analysis will clarify this point. A surface lightning stroke is accompanied by a corona discharge across the surface at right angles to the main channel. The corona tends to cause “tributaries” of the main discharge to join the main channel at right angles. It is unusual for rivers to do that, and if they do it causes erosion of the opposite riverbank. There is no evidence of channel disturbance at such junctions in the left-hand image. The corona can also cause transverse features in the channel floor. On Mars they look like sand dunes in serried ranks along channel floors. There are hints of this effect in the center and right-hand images. Where the surface discharge connects with the atmospheric discharge a crater usually forms. A cosmic lightning bolt may rake across the surface leaving a chain of craters. A low resolution image may also give the transverse effect seen in the images above. Surface lightning tends to force parallelism of close tributaries due to electromagnetic forces between the two channels. We see a possible example in the lower right corner of the left-hand image. Lightning channels may “appear out of nowhere” on a surface or terminate on a crater. There are no catchment area or feeder channels as required by river systems. The tributaries are often stubby and begin in a circular crater. Rivers maintain a constant cross-sectional area between feeder channels. Lightning has no such constraint and may, depending on the electrical nature of the surface, carve a deep V-shaped channel or skim across the surface leaving almost no trace. 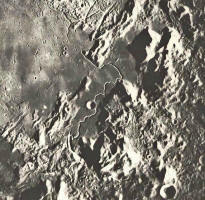 The renowned Hadley’s Rille on the Moon (click image left), visited by astronauts, shows this characteristic. It may require a Titan orbiter, though, before this kind of detail is available. Already the electrical model is the only one to have successfully predicted the kind of surface features we would find on Titan. In coming days we may expect to see better quality images that can be used to further test the model.